Who are the rising stars in the Democratic Party? Which of the most popular among libs blogs, MM, Think Prog, or Kos did you get this crap from. Maybe a link would convince someone. If the Democrats could only get someone as ethical as Corzine. Or maybe as smart and as appealing as Debbie Wasserman Schultz. Paul Ryan and Eric Cantor make the future of the Democratic party look very good. When there is an open GOP nomination (no GOP President seeking another term), the guy who finished second last time -- if there is any such candidate in the race -- wins the nomination. McCain, Dole, GHW Bush, Reagan, they all fit this description. And Romney, of course, finished second in 2008. Which makes it interesting to watch and see who finishes second this time around. One thing worth noting, for all the talk of Ryan and West and Cantor, members of the House don't win Presidential nominations, except when they go on to hold some other office in the meantime, such as Senator (such as McCain, Gore, Dole, Nixon, Kennedy), Vice President (Gore, GHW Bush, Nixon) or major executive branch appointment (GHW Bush), President (Ford). It hasn't happened in over a century. Hillary is still the most loved Democrat out yhete right now. Her approvsl ratings r very high. Why can't Democrats EVER tell the truth? Grayson made his fortune as the first president of IDT Corporation (International Discount Telecom), which pioneered competition and discount pricing in the long-distance telecommunications industry and became a $2-billion-a-year Fortune 1000 company. Alan Grayson made his money as a fat cat president of a billion dollar a year corporation, he's a 1%er to the core and he loves the fact that ignorant liberals fawn over him thinking that he's one of them. Alan Grayson wants your votes, he knows most liberals are stupid enough to hand them over freely. You can be part of the 1% and still be in the interest of the common people, the middle class, the poor, so on and so fourth. IDT filed a law-suit against rival companies for committing fraud against their consumers. That's pretty incredible. But, a lot of billionaires and millionaires, even the ones in politics, as Tempest pointed out, vote against their own interests. Sure, it's a great idea to give tremendous tax cuts and breaks to the wealthiest members of society, but those tax breaks hurt everyone else. People like Grayson vote against those tax breaks, even though he personally would benefit. How many of your GOP cronies can claim that? 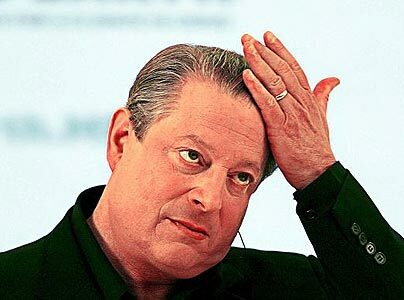 There's always AlGore hanging from the ceiling. I mean waiting in the wings.